Piero Taruffi - known as the Silver Fox - was that rare combination of skilled engineer and brilliant racing driver, on four wheels and two. 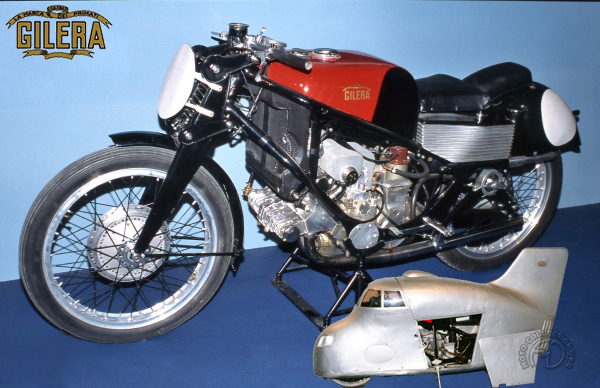 In 1935 he produced an advanced four cylinder racing bike, the Gilera Rondine (Swallow), which was the inspiration for all the Italian fours that dominated Grand Prix racing from 1952. Its overall design became almost a cliché in the period from 1984 to 1990 with the Yamaha FZ 750 and 1000. In supercharged form, the Rondine developed 80 hp @ 9000 rpm, a hefty output for its day. Its frame was the progenitor of the modern "Deltabox" with its two wide cradles (pressed steel on early examples, then tubular), which met the steering head at 180- degree angles. The rear suspension was unique, too, with two horizontal springs beneath the engine.